Savandurga is a huge monolith standing 1226m above the sea level. It is situated near to Magadi town and the remains of the fort built by Kempegowda can be found atop the rock. 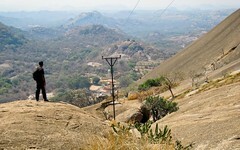 There are two rock hills named Karigudda and Biligudda with a pond near by. From the top the Akravati river can be seen. The hill directly behind the lake is easily trekkable and has a perennial lotus pond in it. For best trekking experience visiting during Winter or Summer months will be the best. November to March is the best time. Avoid visiting during rains. There are only a few shops at the town downhill. There are no hotels available. Carrying packed food is essential during the visit. Savandurga is 60km from Bangalore. Route 1: Bangalore - Magadi - Naykanapalya - Savanadurga. Reaching Magadi is easy in KSRTC or private buses available from KR Market. One needs to get down before Magadi at the Ramanagaram road. Any bus to Ramanagaram will take you till Nayaknapalya. From Nayaknapalya its only 4km away for which autos are available.